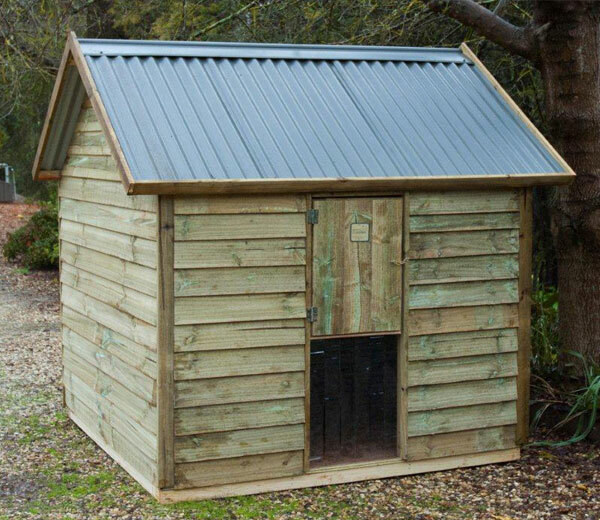 The timber dog hut like our wooden kennels and cubbies is sturdily built for longevity with design consideration for pet comfort and protection. The frames and cladding are built from pet safe ACQ treated pine. The wooden hut dimensions are: 1800 x 1800 mm x 2200 mm at top of roof pitch. It is modelled on and similar in construction to the Cottage or Club House timber cubbies. There is a large door in the front wall for access to the hut. Built from treated pine at the top with a plastic drop curtain at the bottom, it shields the interior from the weather and allows for continued access through the curtain for your pet. The top door is hinged and has a latch and magnetic catch, which can be opened to allow access for you. There is a sturdy yellow tongue floor raised on a solid treated pine frame to keep your friend from the damp. The kennel has a high pitched colourbond roof to allow for plenty of ventilation with your choice of colour from the Colourbond range. There is plenty of room inside to allow for several dogs and for modifications such as a suspended floor, ramps and even storage of pet supplies. This timber hut is ideal for the large dogs that will not enter a small wooden kennel and need lots of ceiling height to feel secure. The timber hut can be purchased as a standalone unit or combined with one of our galvanised meshed dog runs. When combined with the larger run, there is a total of 10 m sq area of enclosure plus the 3.5 m square of hut. Plenty of room for any canine to stretch the legs and play in. Stained with Aquadeck Merbau – add $105, $90 and $80 respectively. Kidzone Cubbies are located centrally to cost effectively supply our quality timber pet houses to the Eastern States including Sydney, Canberra, Brisbane and Melbourne. If you have any questions about our wooden products or require a free no obligation quote, please contact us on 0425 787 358 or via our contact page. We also offer a special price for installation if you can provide someone to help.